Terrified more than scared. I still can't believe I took this picture. Maggie (yes this spider even has a name) eats things the same size as her. However she makes humans like me run in fear. Maggie lives at London Zoo in Regent's Park if you feel inclined to pay her a visit. Where is the big fly-swat when you need it? 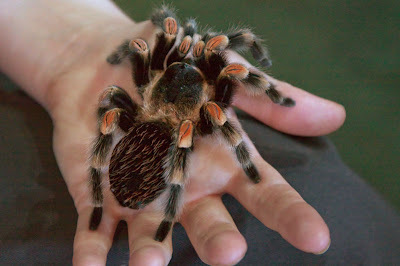 Many years ago, I held a spider this size as part of a school assembly. Her name was Goldilocks because the tips of all of her jet black hairs were golden. She was surprisingly heavy. Yikes!!!! That just creeps me out! Creepy Crawlers despite being scary can be quite beautiful, as is this specimen. Our dog is named Maggi, and what a difference between the two. Our Maggi receives lots of pats and love! Ugh, koodos to you for being able to take that picture, I wouldn't even have been able to get close!!! I don't think you'd get me within a 1000 feet of her. Kudos to you for pulling off the shot. If you can bear to look, she's actually rather attractive - but I wouldn't like to find her in my bananas! Maggie is a kind of beauty but i think i couldn't take her in my hand !!!! Very courageous. I want to try it too.